We aim to share the knowledge gained from clinical research studies, as well as the published clinical care guidelines, in ways that can be easily understood by patients and their families. We also aim to find better ways to educate patients, family, clinicians, and health care providers about the impact of maternal IBD and IBD therapies on maternal and fetal/neonatal outcomes. 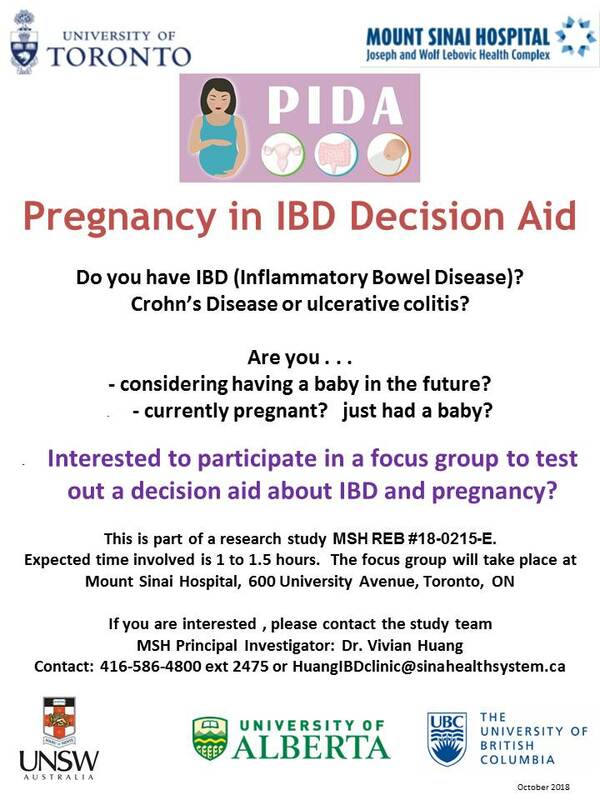 1) PIDA (Pregnancy IBD Decision Aid): A decision-aide to help women with IBD and their health care team make informed decisions regarding the management of IBD during pregnancy and peripartum. We brought together a multidisciplinary international committee including members from U of T, UBC, U of A, and Australia, along with patient partners. Together with patient representatives, multidisciplinary care providers, and knowledge translation experts, we will develop decision aides for patients with IBD to help them make decisions about their IBD management in their journey from preconception, pregnancy, peripartum, and post partum. We also aim to develop parallel decision tools for clinicians who care for these patients, to help make informed decisions regarding medication and management of the IBD. If you are interested to provide feedback on the PIDA, please email us at Vivian.Huang@sinaihealthsystem.ca (Toronto).